Why Pick the UAMS DPT Program? The Doctor of Physical Therapy program is a continuous 34-month, full-time program that enrolls a cohort of 24 new students each August. This is a cohort-based full time program with a lock-step curriculum. The program offers a 4+3 curriculum, requiring a baccalaureate degree prior to admission into the program. The program requires 120 credits of coursework, including 36 weeks of full-time clinical internships. Upon completion of the degree requirements, students are awarded a Doctor of Physical Therapy degree. The curriculum uses the flipped classroom concept, with many lectures delivered electronically to the students and in-class and lab time devoted to integration of material and problem solving. In-class sessions involve problem-based and team-based learning, as well as, interprofessional learning experiences. The DPT program is located at the UAMS Northwest Campus – in the heart of Fayetteville, Arkansas. The UAMS Northwest Campus offers educational opportunities for students in the UAMS Colleges of Health Professions, Medicine, Pharmacy, and Nursing. The campus offers state of the art library and clinical simulation facilities, and a new on-site student-led inter-professional clinic. Programs at the campus are designed to promote inter-professional learning and clinical experiences. 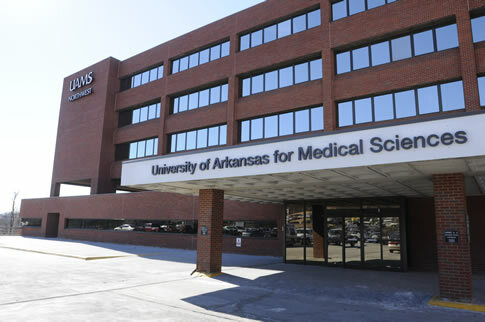 The newly renovated facilities at UAMS Northwest include spacious, dedicated teaching labs for the PT curriculum as well as the State Veteran’s home and two operating clinics – a multi-disciplinary clinic and a dedicated outpatient therapy clinic, where faculty and students will have ongoing patient contact, beginning in the first month of the curriculum. Upon completion of the degree requirements, students are awarded a Doctorate in Physical Therapy. Located in the foothills of the scenic Ozark Mountains and close to metropolitan areas including Little Rock and Tulsa, Fayetteville boasts a thriving cultural scene, easy access to outdoor recreation, eclectic shops, and restaurants that serve everything from comfort food to organic cuisine. The city is complete with gorgeous trails, running streams, serene lakes and breathtaking foliage, offering something for everyone: nearby hiking and a trail system that runs throughout the city, live music and entertainment on Dickson Street, canoeing and rafting on nearby rivers and water sports at Beaver Lake, local theater offerings, and museums. Fayetteville is home of the University of Arkansas with outstanding research and development capabilities, a world class public library, superior academic facilities and amenities, and the Arkansas Razorbacks. Forbes Magazine has also named Fayetteville, Arkansas as one of the best places in the U.S. for businesses and careers. With a population of 500,000, Northwest Arkansas is one of the fastest growing and most dynamic regions in the United States. With the beautiful Beaver Lake and the majestic Ozark Mountains that define the Natural state, the northwest Arkansas region, inspired by its surroundings, is the up-and-coming leader in business, education, sports, tourism and arts & culture. The DPT Program has developed a strong clinical phase for the program by establishing partnerships with the top health care facilities in the state of Arkansas and beyond. Clinical rotations will take place in acute care hospitals, rehabilitation centers, out-patient clinics, private practices, extended care and skilled nursing facilities, home health organizations, occupational health centers and the Veterans Administration. Physical Therapy Program Graduates Its First Class! Loni Cooper, PT, DPT is the recipient of Women in PT Summit Scholarship funded by the Section on Women’s Health. The Doctor of Physical Therapy program at UAMS is accredited by the Commission on Accreditation in Physical Therapy Education (CAPTE), 1111 North Fairfax Street, Alexandria, Virginia 22314; telephone: 703-706-3245; email: accreditation@apta.org; †website: http://www.capteonline.org. If needing to contact the program/institution directly, please call 479-713-8600 or email ptprogram@uams.edu.